Ray Eldon Brundige (July 14, 2018) | Burmeister-Johannsen Funeral Home, Inc.
Ray Eldon Brundige was born on May 11, 1935, at St. Anthony’s Hospital, Carroll, Iowa, to Warren and Katherine (Poynter) Brundige. He lived with his parents, enjoying farm life until his father retired and the family moved into Irwin, Iowa. Ray graduated from the Irwin-Kirkman Community School in 1953. Ray enjoyed nothing more than attending ball games in the area. 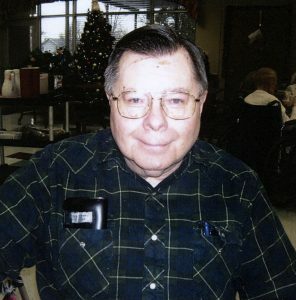 He worked at the Country Care Center, Harlan, Iowa, for several years. When health concerns caused him problems in getting around, Ray entered the Manilla Manor in Manilla, Iowa; he very much enjoyed his 14 years as a resident there. Ray E. Brundige died on Saturday, July 14, 2018, at Myrtue Medical Center in Harlan, Iowa. He had reached the age of 83 years, 2 months, and 3 days. Ray was preceded in death by his parents; three brothers, Donald Brundige, Robert Brundige, and Kenny Brundige; and one sister, Ina Bernard. He is survived by one sister, Betty Scott of Murrieta, California; one sister-in-law, Barb Brundige of Irwin, Iowa; nieces and nephews; and other relatives and friends. A private graveside service was held on Friday, July 20, 2018, at the Oak Hill Cemetery, Irwin, Iowa, with Pastor Vicki Fisher of the United Church of Manilla, Manilla, Iowa, officiating. The Burmeister-Johannsen Funeral Home in Harlan, Iowa, was in charge of the arrangements. Condolences may be left online at www.burmeisterjohannsen.com. When we lose one of our loved ones from our hometown the family tree of Irwin withered one branch. You will be missed Ray….You will be missed.